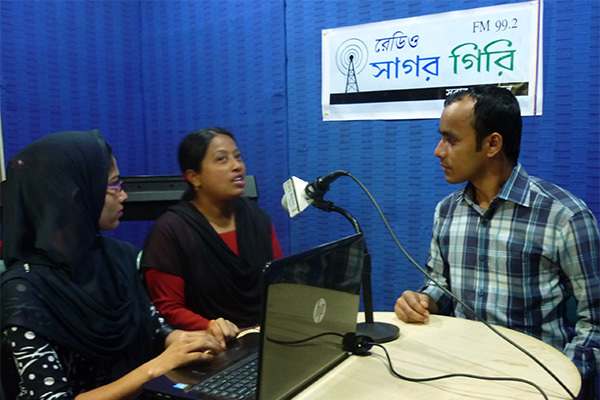 Radio Sagor Giri FM 99.2 arranged a radio talk show on “Youth and Radio” to mark the World Radio Radio Day 2015. This talk show was facilitated by Mohsena Aktar, Program Producer, Radio SagorGiri FM 99.2. The guest speakers were Abdus Sabur- Youth Focal: YPSA, Bebek Kanti Das, representative from civil society, Yousuf Ali, representative from local Youth and Jesmin Akter representative of women also a social worker. This talk show was started by the addressing speech of Mohsena Aktar, Program Producer, Radio SagorGiri FM 99.2. He welcomed the invited participates of this talk show and made introducing of participants with radio listener. Facilitator made a short description of this day. In whole program facilitator made short question to invited speakers with relative question of this campaign. Facilitator asked how to youth play vital role on community development through community radio. In question, answer and discussion period Abdus Sabur, Youth Focal; YPSA shared the goal and objectives of this day, also shared the potentiality of youth in community development. He said that one thirds of the total population of Bangladesh are youth, they are power. He also argued that youth can play a vital role in community mobilization through community radio. In question, answer and discussion period Bebek Kanti Das, representative of civil society shared the roles of youth to prevent violence in community and the importance of youth in reducing violence from all level of the society. He also argued that youth can uses community radio in this regards. Jesmin Akter representative of women also a social worker shared how to reduce violence against women, way of women empowerment using community radio. Representative from local youth Yousuf Ali shared that, they learnt lot from community radio as Radio Sagor Giri especially; English learning program, reproductive health program and life skill program. He believed that Community Radio is easiest way to raise voice of grassroots people. Finally, Mohsena Aktar, Program Producer, Radio SagorGiri FM 99.2 shared that this year, the Day’s principal theme is the promotion of youth in radio, both as a conduit for the greater participation of young people in radio journalism and communications as well as encouraging the world’s under-30 population in being facilitators for sustainable development. In Radio SagorGiri was fully facilitated by local youth people through full time, part time and volunteering. He also encourage local youth for working in community radio for empowering themselves.